Cook pasta according to directions to your desired doneness. Drain and let cool. If serving the pasta salad cold, run the cooked pasta under cold water to cool it off quite a bit. While the pasta cooks, chop up your veggies and make your dressing. Make the dressing by combining the olive oil, vinegar, spices, and sugar. Whisk until fully combined and set aside. 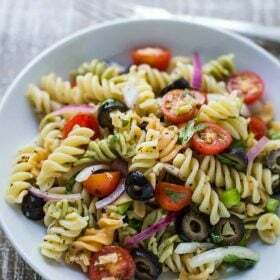 In a large bowl, combine the pasta, chopped veggies, parsley (or cilantro) and dressing. Toss until the pasta and veggies are fully coated in the dressing. Salt and pepper to taste and ENJOY!! !